Al Salam Camp v Luxor, Egypt: Zarezervujte nyní! Whether you are road-weary traveller or a bushy-tailed adventurer seeking something a little different, Al Salam Camp is the perfect escape off the beaten track. 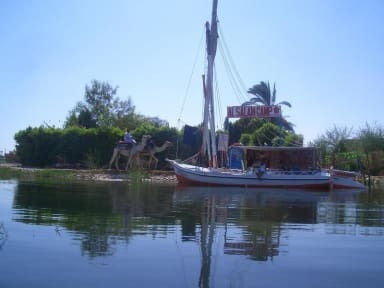 Cross the Nile and step into a peaceful world free from the hassle of touts, taxi drivers and tour groups. What is Al Salam Camp all about? Al Salam camp ensures the safety of its guests. Be welcome and free from worry. Be it land, sea or air, we can arrange almost any kind of transport or ride: Camels, horses, donkeys, bike and motorbike hire, hot-air balloon at sunrise or faluka at sunset. Just ask and we will make your dream a reality. From time to time we arrange special activities at Al Salam, such as having musicians perform, workshops or small movie screenings. If a group of people has an activity they we like to enjoy at the camp, we are always interested to hear it and to try and make it so. Our guests come from all over the world - no matter who you are, you are welcome. We have eight comfortable huts built in traditional style and sited around a central courtyard where you can eat, relax and plan your adventures. There are three types of hut available: private twin, private double and 4 person dorm. All rooms have a ceiling fan and mosquito net, and there are plenty of blankets for the winter months (which are generally not too cold). The shared bathroom facilities are clean, spacious and hot water is available. 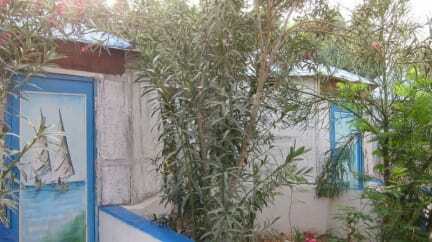 Private huts and dorm huts are clean and tidy and free of pests. Mosquito netting is also provided above beds. Bathroom facilities are shared (locks on showers and toilets), however because of the size and intimacy of the site, they are kept in pristine condition to ensure the comfort of our guests. There is also room to pitch your tent or park your vehicle if you so desire.